The cause of warts is Human Papillomavirus (HPV) infection and it is so communicable that even the slightest touch can induce its existence. 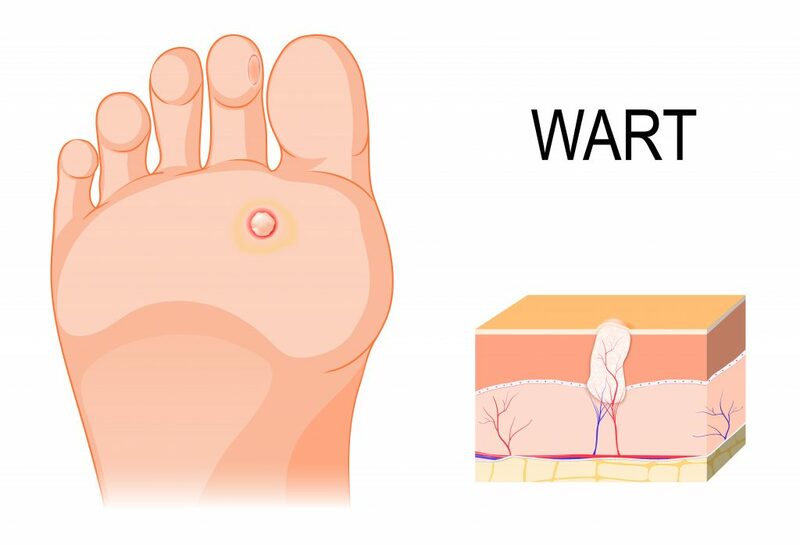 The first step to identify warts is the physical appearance at the bottom of the feet because when they take birth at the bottom of the feet, and pain is also accompanied with it. Through studies, it is found that more than 7-10% of the general population suffers from warts. Not only it is a painful medical condition but also a source of embarrassment and affects your confidence and self-esteem. Yes, they are known to be ugly and annoying but if the scientific things are considered and looked at the greater concern than the only good thing about warts is, it is not life-threatening. A wide amount of treatments are available that accelerates the healing process and but not all works the same accordingly. Usually, the life of a wart is from 1 to 5 years if not medical attention is given to it but it is always advised to get a treatment for it that is large in the number or around the sensitive areas. The contaminated areas when getting a direct skin-to-skin contact, such as shaking hands with someone who has warts on their hand. You can also get the virus causing warts from inanimate objects, like towels that have been used by someone with a wart. 1. The Immune System: Once you are attacked by warts, the first thing you start facing is a weak immune system. The reasons for a weak immune system are many and the scariest one is an HIV infection. When a person is diagnosed by an HIV infection, his immune system is affected and thereby the high chance of warts occurs in the body. Some other reasons that contribute to weakening your immune system are suppressible drugs, lack of sleep, stress, etc. 2. Tight Clothing’s: The wart would attract body sweat very easily and thus you are advised to stay away from sweat as much as possible. Sweat opens up the door for warts to invade your skin. Hence, try wearing loose clothing. 3. Off Sharing: You just cannot afford to share during this time, and you must do so if you care for others. Not only the handshakes and hugs, even sharing towels, but razors and other personal items with the infected person will also be contagious. Hence, it is highly advisable not to share any such personal items with anyone. 4. Moisture and Its Effects: If you are someone who prefers staying barefoot and get exposed to the moist surface like in the public showers, swimming pool areas, and locker rooms then the chances of getting warts increases. 5. Nail-Biting: Biting nails are not only bad habits but also increases the chances of warts to occur on your skin. Make a habit of washing hands thoroughly and regularly. You must stay responsible and even after your gym, make sure to clean the equipment before its use and use a clean cloth to clean the equipment. Keep a rubber flip-flops in the shower or gym’s locker room so that warts don’t get an easy access to your body. You might have heard the phrase, “Precaution is better than Cure” and thus if you do not even suffer from warts, still you must keep yourself highly hygienic and start adopting such habits. Moreover, you can also try Homeopathic Treatments for treating warts as they are known to be the most effective from rest of the treatments. This entry was posted in Warts and tagged How to take care of warts, What are warts. How to Treat Skin Pigmentation at Home?